Bring chicken stock with ginger and lemongrass to a boil and simmer for 1/2 hour. Strain and reserve half of the chicken stock. Add coconut milk and honey to the other half and reduce by half. Season to taste. Bake sweet potatoes. Peel and press through potato ricer onto a flat surface. Add parmesan and egg yolks. Slowly incorporate flour to form the dough. Roll into logs and cut dough into 1 inch pieces. Poach in boiling salted water. Gnocchi are done when they float to the top. Place salmon in a saute pan and add the rest of the chicken stock. Bake in a 400°F oven for 8 minutes. Saute snow peas in butter. Reheat gnocchi in coconut broth. Blend olive oil and guajillo chiles in a blender until oil is bright red. To serve, place gnocchi in a large soup plate. 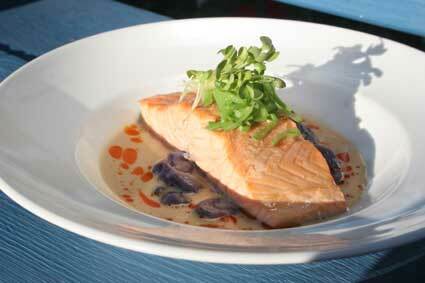 Place salmon on top and pour coconut broth around. Top salmon with sautéed snow peas. Drizzle chile oil and ponzu sauce into broth and garnish with daikon sprouts.